Why contact Join the Band about music lessons and bands? There is simply nothing better than taking music lessons and playing in a real performing band! Contact us today and we will place you with other musicians, coach your rehearsals, assist you with private music lessons, and let you show it all off at our famous Join the Band® Concerts. 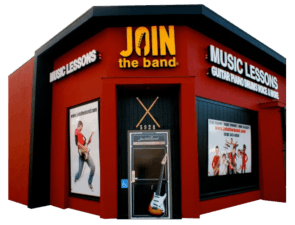 Music lessons and bands for kids, teens and adults! Everyone Plays! Come be a part of it! Join the Band! We also specialize in teaching beginners. If your child (or you) are new to music, we have the right teachers that can customize a lesson plan to meet your needs. Fill out the contact form below, or call us at 818-345-8950 and our Join the Band team will be happy to help you choose the right music lessons and band programs. What are our Join the Band clients saying? My daughter has been with joined the band for about a year now. She takes vocal and guitar lessons as well as being part of the band program. Being a musician growing up in LA I can’t stress enough how great this program is! John and the staff at join The Band are absolutely incredible. My daughter has grown in her confidence and ability! Couldn’t be happier to have her be a part of this program. I’ve had 2 kids participate in Join the Band and it’s been a wonderful experience. Most kids (and adults) don’t get to experience playing with other musicians until they’re somewhat accomplished at their instruments. But with JTB they are able to learn and enjoy playing together no matter what their level of proficiency. My kids played drums and guitar and had a great time while learning cooperation, patience and the great skill of communicating non verbally through the shared experience of music. And we loved going to the shows!